Campaigners claim wild salmon returning to a river in the Isle of Lewis are infested with sea lice originating from local fish farms. Salmon and Trout Conservation Scotland said wild fish have been found dead or dying at the mouth of the Blackwater river at Loch Roag. The group has alleged the Scottish Salmon Company's seven fish farms in the sea loch were to blame. The company said it took fish health and welfare "very seriously". 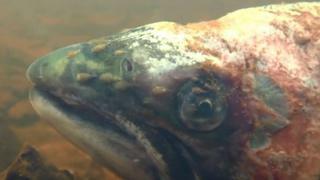 Campaigners said a video and photographs of lice-infected wild salmon provided evidence of the scale of the problem. Andrew Graham-Stewart, director of Salmon and Trout Conservation Scotland, said: "We believe that the explosion in lice numbers on the Loch Roag farms, spreading out into the wider sea loch environment, has had deadly implications for wild fish, as they were waiting to enter the Blackwater. "Adult salmon are well adapted to coping with a few lice but, when plastered with hundreds, they simply do not have a chance." The Scottish Salmon Company said fish health and welfare was "central to responsible salmon farming". A spokesperson said: "However, as with any farmed stock, mortalities can occur and this has been exacerbated by the warm weather this summer. "Following receipt last week of video footage and photographs, the Scottish SPCA visited at random a number of sites. "The Scottish Salmon Company have not had an opportunity to examine or authenticate this information, but openly facilitated the SSPCA visits and look forward to receiving their feedback."